Reprinted from the August 1998 Sierra Club Yodeler, newspaper of the SF Bay Chapter with generous permission from editor Don Forman. Dr. Ertter, Curator of Western North American Flora at the University and Jepson Herbaria, frequent Yerba Buena Chapter speaker and active Albany Hill site steward, talks about an ideal way to think globally and act locally. Wander around the various parks and open spaces of the San Francisco Bay Area, and the odds are increasingly high that you will encounter groups of individuals pulling up plants by the roots and building piles of wilting vegetation. Some plants are clearly “weeds,” but many others comprise the showiest displays of “wild” flowers and shrubs, leaving an unsightly swath of bare ground and dying plants in their wake. But before you seek out a ranger and report this apparent vandalism, strike up a conversation. Chances are you have just stumbled across a dedicated band of community site stewards, the front line “army” engaged in protecting the Bay Area’s unique natural heritage from an onslaught of devastating invaders. As human residents of the San Francisco Bay Area, we smugly appreciate our good fortune in living in one of the most favorable climates in the world: mild winters, moderate summers, diverse topography, year-round hiking in redwoods and on ridges. It should therefore not come as a surprise to learn that this same diversity of favorable microclimates also fosters a world class diversity of plants and animals, many of which occur nowhere else. And a diversity which we are still learning about: new plants and animals (mostly insects) are still being discovered in the counties that surround San Francisco Bay. Even before the hamlet of Yerba Buena covered the vast sand dunes to become San Francisco, or the East Bay flatlands disappeared under residential communities, many of the species that occur here would have qualified as globally rare. 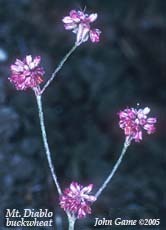 Some are now potentially extinct (e.g., the Mount Diablo buckwheat), while others hang on to continued existence by a toehold. Of potentially greater significance to global biodiversity, however, is the incremental bleeding away of the bulk of species that aren’t in the limelight: individual by individual, population by population. Even more insidious, much of this erosion is occurring in those areas we think are “protected”: regional parks, open spaces, wildlife refuges. Already reduced to islands by the loss of surrounding habitat to development, these fragments of the Bay Area’s natural heritage are under siege. The prime culprits are organisms that have been brought to the Bay Area by human activities, either by accident or intentionally. Among the most insidious are the ornamental plants that add such vibrant color to Bay Area gardens. Alas, many of these lovely plants from other parts of the world have overstepped their welcome and made themselves at home, often at the expense of our unique natural heritage. This is not always apparent at first, and there are indeed numerous non-indigenous species that (at least thus far) seem to be benign supplements to local biodiversity. 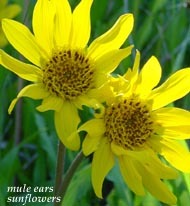 Others, however, earn the epithet of “non-indigenous pest plant” by gradually displacing all other species at a site. What begins as a selection of colorful novelties added to a drab slope (at least to the untrained eye) can easily become a monoculture of iceplant or an impenetrable thicket of broom. And the delightful diversity of indigenous plants, many of which grow nowhere except coastal California, have disappeared from yet one more fragment of their former realm. And with the plants go any mammals, birds, insects, and other forms of life that depend on exactly those plants or the habitat they create. One might ask, given our relatively dismal track record to date on ecosystem management, “Who are humans to decide which species have a right to be here and which not?” The answer involves ethical components, primarily responsibility and reparation. Humans are responsible for bringing non-indigenous pest plants to California, which gives us not only the right but the obligation to try to keep them from doing harm to that which was already here, especially that which occurs nowhere else. The reasons for the lopsided advantage held by non-indigenous pest plants are complex. In general, these same plants were harmonious members of their original communities, part of a complex web of interactions with other species in that area. However, the various pathogens and predators that kept them in check in their homelands have been left behind, allowing a population explosion out of balance with their new surroundings. Control efforts often accordingly include a biocontrol component: the deliberate searching out and introduction of pathogens and predators that can bring the pest plant back into balance. This, however, is an expensive and tricky business, with prolonged testing necessary to determine if the potential biocontrol agent is specific to the targeted pest plant, or if it will also attack indigenous or agricultural plants. Herbicides, although often an essential part of the “integrated pest management” toolbox, are also potentially hazardous, frequently mis- and over-used, and accordingly controversial. On the other hand, the development of community site stewardship projects have multiple benefits beyond the control of plant invaders. Most often arising as community-based grass-roots efforts, individuals who have become aware of the threat posed by non-indigenous pest plants band together to protect their favorite piece of local “wild.” A synergy develops as these grass-roots efforts share information and coordinate efforts, either informally in “stewardship fairs” or within the framework offered by the Golden Gate National Recreation Area, San Francisco Recreation and Park Department, California Exotic Pest Plant Council, and other organizations. Community site stewardship has the further benefit of fostering a strong “sense of place” that is an essential component of any sustainable relationship with the planet we call home, even beyond the initial attachment that causes one to take action in the first place. This is because a major challenge in site stewardship is that the best methods must be determined for each site; there are no pre-existing “owners’ manuals” telling us what to do and when. The goal is to figure out what actions will do the most to control the targeted pest plants with the least effort, while simultaneously benefiting (or at least minimally impacting) the indigenous plants, birds, insects, and other members of the biotic community. The primary sources of the necessary information are an understanding of the species present, attention to the cycles of the seasons, and a willingness to learn from the results of previous actions. There is the feeling of letting the sites speak to us directly, telling us what they need from us in order to heal. In contrast to “restoration,” which conjures up images of planting native trees and wildflowers on ecologically degraded sites, stewardship efforts are usually directed toward giving what is at a site the best chance possible to remain at that site, “tipping the balance” back to the indigenous species. “Tipping the balance” means that a targeted pest plant does not need to be eradicated in a single season. What matters is that each year the pest plants are worse off than they were the year before, and that the indigenous species have an improved chance of survival. The longer view is also essential to counteract any negative reaction to the immediate results of site stewardship activities: piles of wilting greenery, devastated floral displays, swaths of disturbed ground. It is when one returns year after year that the rewards are evident: trilliums and ferns covering the forest floor where ivy had reigned, half-smothered trees filling the gaps with new foliage. Just as it is incrementally, too often imperceptibly, that we lose ground, so also must it be incrementally that we gain it back. The urge is nevertheless strong to speed up the process, and to seek fulfillment in planting rather than simply uprooting. This is particularly justified for those plants that have nearly disappeared from the site, such that the odds of persisting unaided are stacked high against them. However, it is distinctly possible, given the unique attributes of each site, that the lineages of plants that have persisted at one site for uncounted generations have become slightly different from lineages from other sites, even within the Bay Area. As a result, a preference for “native to site” involves not only aesthetic and philosophical aspects, but also takes into consideration the increased likelihood that plants from a lineage that is already growing at a site are genetically fine-tuned for surviving and persisting indefinitely at that site. In line with the focus on preserving what is already present, the preferred strategy is therefore to propagate from the remaining plants, with the offspring planted back to the same site in areas from which pest plants have been removed.